Fit athletic young dancer leaping in the air as she practices in a dance studio in front of a large wall mirror low angle with copy space. Sexual young woman in shorts standing barefoot in front of mirror in studio and performing sensual dance practicing alone. Young boxer is training on dark background. 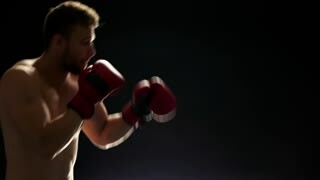 Young athletic man in boxing gloves practicing box. Skillful and goal-oriented boxer. Sensual young woman in black bodywear posing in front of mirror while practicing expressive dance in studio.